In many huge contented websites it is very difficult to find some information like any link, page, text etc. So, they use a textbox where visitor types his keyword to search. There are couple of ways to create it like, to search the content from database, crawler. But if you don't have such things then we use Google Custom Search. In Google Custom Search, we create account in Google and provide the domain information to Google and then Google generates some codes which are used inside our web application. If we use the Google Custom Search codes in our application, then Google searches the content from your website. It is available in cost-free and paid also. In cost-free there will be some advertisement of Google. Let's take a look how to create it. Click above link to create Google Custom Search. At the end of this process you will receive some codes generated by Google and you have to keep it for use inside web application. Here is code given Google for my own domain hostforlife.eu. 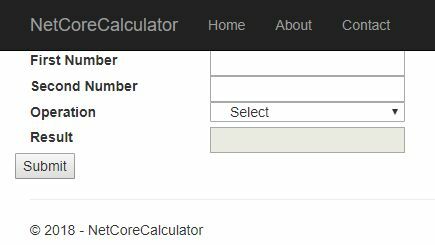 ASP.NET Core 2.2.1 Hosting - HostForLIFE.eu :: How To Use An Area In ASP.NET Core? In order to include an Area in an ASP.NET Core app, first we need to include a conventional route in the Startup.cs file (It's best to place it before any non-area route). In Startup.cs, configure the method. Then, make a folder named Areas in the app root and make another directory named Admin inside the former. Inside the admin folder, create the following folders (ViewComponent is optional). Now, we will create a Controller inside the Controllers folder named AdminController. Now, in order for that to work, you'll need to create Views for all actions that return one. The hierarchy for Views is just like what you have in a non-area Views folder. Question - What if I want to have another Controller inside my Area? The important part is [Route("admin/[controller]")]. With that, you can keep the style of routing to admin /controller/ action/. Why Is Canopy Stabilization Layer Built on Top of Selenium? One of the most crucial concepts of Canopy is reliability - when performing an action the framework tries, during the time span specified via elementTimeout or compareTimeout or pageTimeout, before failing. This improves the experience of writing tests. In one of my previous articles, I have already expressed my opinion regarding power and expressiveness of F#. let repo = nth 4 ".pinned-repo-item"
let firstRepoCaption = repo |> someElementWithin ".js-repo"
let repo = nth 5 ".pinned-repo-item"
| Some caption -> read caption == "stationwalk.client"
| None _ -> failwith "Element not found"
printfn "Press any key to exit..."
Most of canopy's assertions, i.e., == accept as a parameter either a string which can be css or xpath selector or instance of IWebElement type which again might be already familiar to you if you've ever written selenium tests using C#. So let's say we want to upload something into file upload control. Patterns which I've practiced to keep test project maintainable include extracting selectors into page modules and moving tests to separate files. | Some caption -> read caption == "stationwalk.server"
Recently, Canopy had a major upgrade from 1.x to 2.x and one of the great new features is the ability to run tests in parallel. The key trick to follow here is that each test operates now with its own copy of browser and assertions are now taken from open canopy.parallel.functions to accept browser as an argument. I hope this article has convinced you that Canopy is a robust and easy to use framework which can be used in building end-to-end testing layers of your application. The namespace System.Diagnostics provides a set of attributes and classes to interact with the system process, event managers, performance counts etc. This namespace can help us too in debugging jobs. Let’s review the useful actions inside System.Diagnostics namespace. DebuggerDisplay attribute drives the string format with debug screen, which shows the value of: class, properties or fields. For this same task, it is best known override ToString method, but use DebbugerDisplay attribute is a better choice, because this does not modify the data structure as it only interacts with Visual Studio debbuger screen. Override ToString method for only this purpose can give problems because many actions in .NET takes this value for default, for example bindings in WPF. This attribute supports delegates, properties, fields and assamblies. DebuggerHidden attribute prevents the compiler from stopping in constructors, methods, properties and indexers declarations. In mentioning this later, my comment might sound lightweight, but in the practice, this can save time push key F11 in debugging. Occasionally, we can’t debug the code of a library, Service etc. because it is not accessible or we can’t add project to our solution. 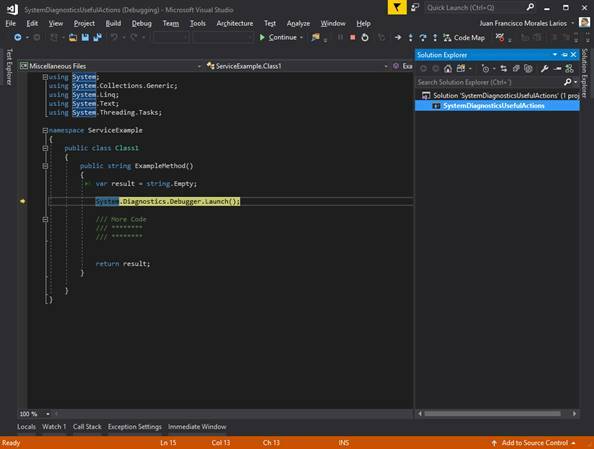 In this case, we can use the Debugger.Launch() method and Visual Studio opens a debug Window and we can debug its code. When executed, the line Systen.Diagnostics.Debbuger.Launch() opens a MessageBox with the instance of Visual Studio Debugger Options. In this window, we can choose, if we open a new stance of Visual Studio (all versions) or if we re-use an existing instance. We can debug the code, as shown below. Conditional attribute allows us to indicate a condition to the methods so that the compiler executes or does not execute its content. We can use it with the precompiler sentences as DEBUG. It will only run if the solutions configurations are debugged. The condition doesn’t exist for RELEASE, therefore we will use a define Directives. These are the useful tips and traps of System.Diagnostics. They become very practical in many cases and I hope you find them useful. In this blog, I will show you how to Insert Data using Uploading Excel file and upload image and set water mark. Let's write the code below. <asp:Button ID ="btnupload" runat ="server" Text="Upload File"
A random password is a combination of characters, numbers, and special characters. We can generate a random password by combining random numbers and random strings. Generate A Random Password In C# And .NET Core. The code snippet in this article is an example of how to generate random numbers and random strings and combine them to create a random password using C# and .NET Core. The Random class constructors have two overloaded forms. It takes either no value or it takes a seed value. The Random class has three public methods - Next, NextBytes, and NextDouble. The Next method returns a random number, NextBytes returns an array of bytes filled with random numbers, and NextDouble returns a random number between 0.0 and 1.0. The following code in Listing 1 returns a random number. The following code snippet in Listing 2 generates a random string with a given size. The second parameter of the RandomString method is used for setting if the string is a lowercase string. // Generate a random string with a given size and case. A random password can simply be a combination of a random string and a random number. To make it more complex, you can even add special characters and mix it up. For us, we will combine the two methods - RandomNumber and RandomString. The following code snippet in Listing 3 generates a password of length 10 with first 4 letters lowercase, next 4 letters numbers, and the last 2 letters as uppercase. All of the above functionality is listed here in Listing 4. Create a .NET Core Console app in Visual Studio and use this code. The random string and random password looks like Figure 1. Now, let’s say, you want to create a password that allows some specific characters only. The following code snippet in Listing 5 has a string of valid characters. The code uses this string to pick one character at a time for the password and stops at the given length. The default length of the password is 15. You can modify validChars string with the characters you allowed in the password. Listing 6 is the complete program written in .NET Core. // Minimum size 8. Max size is number of all allowed chars. How can you handle any incoming HTTP request with a path “AllUsers/User.gif” by returning “Hello From HTTP Handler”. Let MyHttpHandler class inherit from IhttpHandler Interface. In MyHttpHandler class, implement all the methods which are found in IhttpHandler Interface. Let MyRouteHandlerclass inherit from IRouteHandlerInterface. In MyRouteHandler class, implement all the methods which are found in IRouteHandlerInterface and return the MyHttpHandlerwhich are created in the previous section. In RouteConfig class which is related to MVC and WEP API and responsible for requests routing, add the following line code to RegisterRoutes method and before the Default MapRoute. Drop the HTTP Handler registration from web.config, since calling HTTP Handler will be from RegisterRoutes method. Let us go back to section 1. It is a straightforward solution: In RouteConfig class which is related to MVC and WEP API and responsible for requests routing, add the following line of code to the RegisterRoutes method and before the Default MapRoute. If you want to Handle all HTTP requests which have a specific extentaion such as gif you can using the following in web.config. ASP.NET Core 2.2.1 Hosting - HostForLIFE.eu :: How to Unloading Assemblies in C#? If you've created an Application Domain and want to unload all the assemblies loaded within, there is no way to unload Assembly themselves. But you can unload Application Domain you've just created. You cannot unload the default Application Domain CLR created on its own. And unloading can differ from the assemblies being used and the unload events these assemblies have. It can take some time. To Unload an Application Domain all you need to do is calling Unload function. // The Application Domain we've just created is now no more as the assemblies with it. After Unloading Application Domain object, we've also unloaded all the assemblies loaded within. ASP.NET Core 2.2.1 Hosting - HostForLIFE.eu :: How to Cross Domain ASP.NET Web API Calling Using jQuery AJAX ? OPTIONS http://localhost:5000/api/ 404 (Not Found).XMLHttpRequest cannot load http://localhost:5000/api/. No 'Access-Control-Allow-Origin' header is present on the requested resource. Origin 'http://localhost:54317' is therefore not allowed access. The response had HTTP status code 404. As it were you can't make a call to the WebAPI by means of your front end that is facilitated on an alternate domain. So you must utilization JSONP to get information utilizing using AJAX, not by JSON. To attain to this objective you have to introduce JsonpMediaTypeFormatter. For introducing the JsonpMediaTypeFormatter in Visual Studio, seek JsonpMediaTypeFormatter in "Manage NuGet Packages" and install it. To use this DLL you need to change in the Application_Start() method in the Global.asax.cs file. You also can use JsonMediaTypeFormatter code, you should write this code in the App_Start folder & register the following code in Application_Start(). Next step, use the following code to make change in the Application_Start() method in the Global.asax.cs file. This post is about Automapper. As its name suggests, it will do some sort of mapping. Now, the question is, what sort of mapping? Well, this mapping is all about mapping the properties of two objects with each other. If you have worked on MVC, you must have come across the scenario, where the situation demands you to map properties of the model with the properties of ViewModel. Isn't it a common scenario? So, one way to achieve this is to map each and every property manually with a lot of code, which in turn become very tedious when there are many properties of an object. Another major disadvantage of this approach is it's error-prone. Hence, Automapper came to rescue. Automapper is an object to object mapping which reduces the manual effort of mapping each property of a class with the same properties of another class. So, let’s start by writing some code and see how it works. Final step is to do the changes in Controller class to accomodate this mapping. Now, as per the business requirement, the contact object declared in line number 11 can be used. That's all about automapping.